Two major stories — guaranteed to be ignored by most news outlets — provide a glimpse into the Deep State a/k/a Shadow Government. One story describes the use of a foreign intelligence service by the U.S. President to spy on a political opponent, while the second story reveals the use of law enforcement to thwart justice. 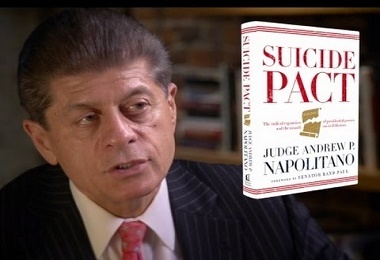 Judge Andrew Napolitano is well-known as a legal scholar and a Constitutional Originalist in the Garden State. While the mainstream news media search and search for proof that President Barack Obama and his minions never wiretapped or spied on then-presidential candidate, now President Donald Trump, a former criminal court judge from New Jersey surprised a morning news show’s audience with a shocking revelation: three different intelligence sources have alleged that President Obama was aided by a British spy agency to electronically eavesdrop on Donald Trump and his campaign. Former New Jersey Judge Andrew Napolitano, considered one of the great legal minds in the United States, claims that Trump’s accusations of being wiretapped during his victorious campaign were correct. Although U.S. actors may not have been directly involved in doing the spying, Obama’s fellow-travelers in Great Britain used their expertise to be the President’s proxy spies. According to Judge Napolitano, now a Fox News Channel legal analyst, at least three intelligence sources said that President Obama went outside his chain of command by not utilizing his own NSA, CIA, FBI, or the Department of Justice. Judge Napolitano, a Brooklyn (New York) Law School professor, said his sources told of Obama’s British contacts using the U.K. GCHQ (Government Communications Headquarters) for the anti-Trump operation. He claims GCHQ officials have 24/7 access to the U.S. National Security Agency (NSA) database. As a result of this relationship between America’s NSA and Britain’s GCHQ, by simply having two people go to British spymasters and telling them that America’s President Obama needs transcripts of conversations involving candidate Trump, and later President-Elect Trump, Obama would be able to receive it all without “American fingerprints” attached. Employing over 6,000 people from a range of diverse backgrounds, GCHQ is part of the labyrinth charged with keeping Great Britain safe and secure. 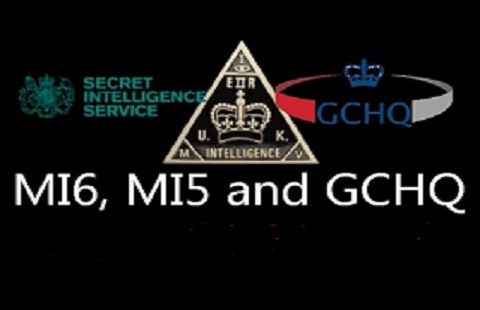 GCHQ operatives work as partners with members of the Secret Intelligence Service (MI6) and MI5, Great Britain’s domestic spy agency. Since the birth of British Signals Intelligence at the Start of World War I in 1914, its commitment for the last 102 years has been to support the U.K. military. “From day one, GCHQ has been [coming] to grips with the many and varied communication means the enemy has been using, sifting through to find the key intelligence for the military and their political masters. Within the first year in 1915, Signals Intelligence was being used to combat, in real time, the air and naval threats. While technologies change and adapt over time, the unique and significant contribution GCHQ makes to protecting British soldiers, sailors and airmen continues apace,” the GCHQ states in its self-evaluation. One of GCHQ’s major responsibilities is helping to protect the UK military wherever they are deployed by providing actionable intelligence. The need to help protect the British military and arm them with the knowledge to keep them one step ahead proved to be the catalyst needed to develop Signals Intelligence at the start of World War I. “About 90 members of GCHQ have received a campaign medal for service in Iraq, and 156 members obtained medals so far for service in Afghanistan. Perhaps more telling is the faith that the military put in a civilian organization to provide the intelligence front-line troops need to achieve their missions as safely as possible in extremely dangerous and difficult combat situations,” the GCHQ press office notes. “With such an impressive legacy one can only wonder why GCHQ would sink to the level of U.S. political hacks trying to swindle a presidential campaign,” said former police intelligence analyst, Lawrence Patronick. “I hope Judge Napolitano will continue his own investigation into the forces in the U.S., European Union and other nations who may be aligned against a President Trump,” Patronick said. Deputy Director of the FBI Andrew McCabe: Swamp Dweller? 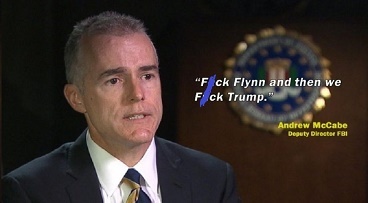 Deputy Director Andrew McCabe, the FBI’s number two leader, defiantly bellowed at an invitations-only gathering: “F-ck Flynn and then we F-ck Trump,” according to sources at the Federal Bureau of Investigation. This alleged gathering was held in seclusion and attended by politically-appointed FBI brass following the election that gave Donald Trump the U.S. presidency. McCabe is a known Hillary Clinton supporter and registered Democrat. He is also the husband of Democratic Party politician Jill McCabe who was running for a seat in Virginia’s State Senate. In fact, records show that McCabe’s wife received a windfall donation from Trump’s opponent, Hillary Clinton, which was filtered through Clinton-minion Terry McAuliffe, the current Governor of Virginia. Also, Andrew McCabe was the head of the FBI group involved in the scandalous Hillary Clinton investigation. It was he who allegedly made the decision against recommending she be charged criminally, which Director James Comey also recommended to Attorney General Loretta Lynch. Lynch made headlines herself when she secretly met with Bill Clinton on his private plane in Arizona a mere four days before Comey announced the decision to not charge Hillary Clinton with any crimes. Jim Kouri, CPP, is founder and CEO of Kouri Associates, a homeland security, public safety and political consulting firm. He's formerly Fifth Vice-President, now a Board Member of the National Association of Chiefs of Police, a columnist, and a contributor to the nationally syndicated talk-radio program, the Chuck Wilder Show.. He's former chief of police at a New York City housing project in Washington Heights nicknamed "Crack City" by reporters covering the drug war in the 1980s. In addition, he served as director of public safety at St. Peter's University and director of security for several major organizations. He's also served on the National Drug Task Force and trained police and security officers throughout the country.